Become a CardConnect partner and enjoy the benefits that come with promoting your business to our 1,500-strong agent base. Additionally, brand CardConnect services as your business. CardConnect’s ticketing and support portal automates the onboarding and underwriting process and makes portfolio management easy. Connect merchant applications to your site or software with our API and make it your own. Integrate with CardConnect to offer your customers access to our gateway and all the features that come with it. We aggressively manage interchange rates so our merchants get the lowest transaction cost possible. Reduced rates and increased efficiency – with features like recurring billing and account updater – make integrated payment acceptance simple. CardSecure, CardConnect’s combination of encryption and patented tokenization, is built into everything we do so that each transaction is protected. With this type of security, no sensitive data touches the business’ network which removes it from PCI scope. We have security solutions for every type of payment acceptance method – from our AJAX tokenizer for eCommerce to our certified P2PE device for card present sales. CardConnect’s Merchant Center is a platform where your clients can fully manage their merchant account and all transactions. Along with extensive reporting and online statements, the application includes a powerful Virtual Terminal and an iTunes-like marketplace. Integrate with our out-of-the-box APIs. If it’s more involved than that – we got it! 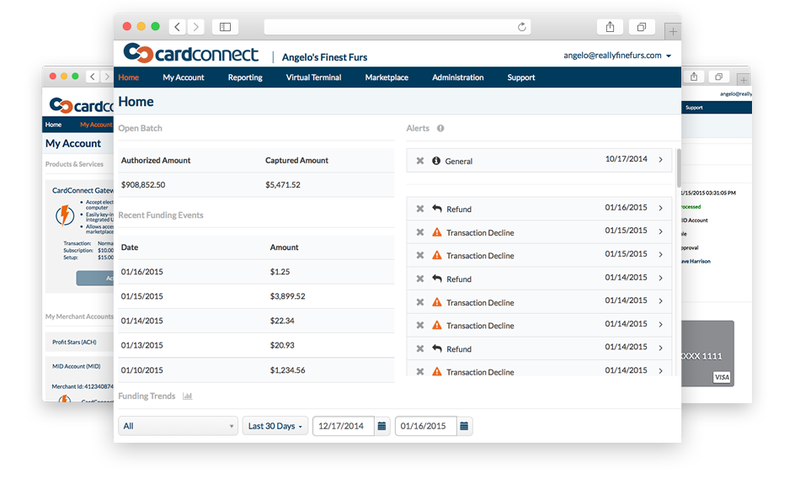 CardConnect has built custom, complex integrations with Oracle, SAP, cVent, and more. Utilize our agent base for your business. Host a CardConnect University webinar and showcase your product to our 1,500 agents. Plus, you’ll get a company page on our website. You’ll work with a dedicated relationship manager and your merchants will have access to 24/7 support. Our weekly CardConnect University webinars keep you up to date on new products. Our experience with software partners has led to a reﬁned marketing strategy focused on educating your clients and our clients about the integration, using a combination of direct mailers, follow up phone calls and emails.